Padded, recycled leather seat for comfort. Nylon-coated screw lift manually adjusts seat height. Steel construction provides extra support. Non-marring feet protect floor. Stores under worksurface when not in use. Ideally suited for workbench and work table use in the industrial, institutional and educational industries. Steel frame with pewter finish for durability. Ideally suited for workbench and work table use in the industrial, institutional and educational industries. Manual adjustable seat height with screw lift. Recycled leather padded seat. 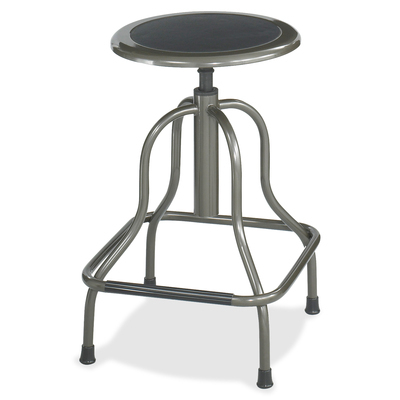 Features pewter powder coat finish for durability and nonmarring feet protect floor.